Although there are two weeks left of the school summer holidays, I think it would be fair to say that the weather has been pretty dismal. British Farmers are worried about their grain harvest and what sort of straw they will end up with as winter cattle feed. Growing conditions have been erratic since a very dry spring then a wet and cool summer. I could do with a trip to the hairdresser as my hair even looks like straw. It has grown quite long and the colour seems to have faded but the new growth is just mousey. I thought I might dye it myself so it is the same colour all over but I could not find a single box of dye that came anywhere near the new natural straw colour of my hair. I expect I will now wait until autumn then dye it accordingly to match the foliage. I tackled some worthwhile mid summer holiday chores, supervising major clear outs in kids’ bedrooms and completed the dreaded repaint of Fergus’ attic room in two days after scrubbing off ancient wax crayon scribbles. The trouble with the new paint is that it makes a scruffy carpet and tatty blind look much worse. While waiting for the paint to dry between coats, I finished quilting all of the 13 roof sections for Yurt 2 with simple lines to look like a corrugated tin roof. These will have to be shaped into wedges then fitted to the Yurt frame with Velcro before I can declare the new roof complete. 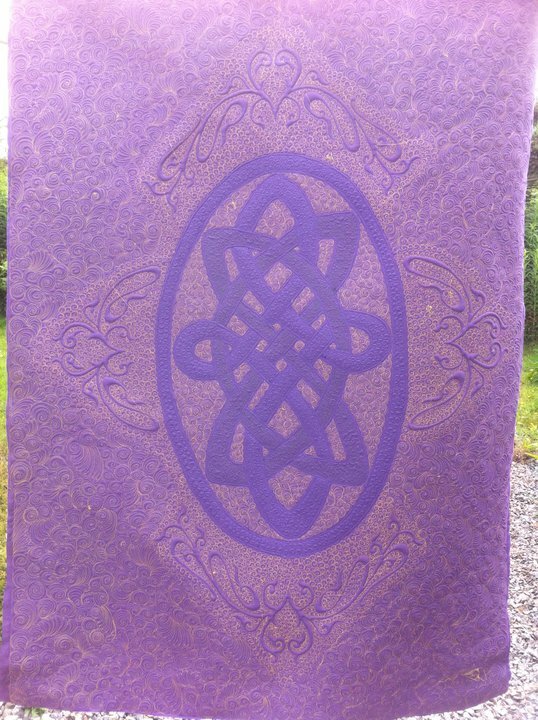 I have started piecing the FINAL panel for Yurt 2 and will take the last three unquilted panels with me to FOQ so that I can demonstrate with Lenni using a scrappy area for the Festival visitors and show off a bit of serious quilting at the other end of the frame. Unfortunately, I had to withdraw the Smart Car cover from the Quilted Creations competition at FOQ as I was unable to borrow a car upon which to display it. I had contacted several Smart Car dealers and the head of marketing for Smart/ Mercedes Benz UK but I was informed that the 35 000 international visitors attending the show were – “unlikely to represent the demographic of a Smart Car buyer” – which is a great shame. I really will have to consider whether it is worth me keeping the cover if Smart dealers can’t see the point of lending a car at quilt shows which would give them considerable free advertising. Perhaps I should try to sell it privately after all. I had some very disappointing news this weekend from the American yurt maker who had offered to make the frame for the USA Yurt tour. He informed me that he would no longer be able to construct and lend a frame due to ill health and economics. This is a major blow to my plans and I wish I had been told FAR earlier! I have been trying to come up with alternative ideas that will enable me to display the Quilted Yurt properly in the USA at the end of September. I have many calls to make this week to see what alternative arrangements can be made. At worst I may have to get the existing frame treated and certified for timber export then shipped at a worryingly unknown cost. I will not be defeated by this huge setback as I am determined that the Yurt will be seen by the American quilters who helped to create it and those who have provided so much encouragement. Profoundly speaking, I have been comparing the various mores and lesses of the week. The children were busy with holiday clubs and one afternoon there were 10 children here for a picnic. Although there was a lot going on, they were not bored therefore they were less difficult to manage. The whole family is making an effort to follow a healthier eating regime by eating food that is more wholesome and less processed. The children enjoyed choosing their ingredients at the supermarket, picking out local produce if possible. We have made bread, muesli bars, carrot cake, soup, salads, mayonnaise, cottage pie, marinaded chicken, yogurt, and pesto which is all very honourable but it definitely involves a lot more washing up! I made myself several TO DO lists; somehow I will have to find a way of ploughing through each of the tasks. I find that the trouble with having limited time is that I want to fit more and more things in. It is annoying that I keep thinking of more overdue household jobs that I want to do that involve paint or major reorganising. My Festival of Quilts entries are more and also less ready to go. So far I have not been able to borrow a Smart Car so it looks unlikely that the pink patchwork cover will make it to FOQ this year. I have been pestering the marketing team of Smart UK and even joined a Smart Car Owner’s forum to appeal for a vehicle, or even a wreck. I sewed on 5 hanging sleeves by hand and have the holes in my fingers to prove it. I was a little lazy regarding the labels and simply attached them with Bondaweb. All that remains is to pack them all up and take them to the Post Office. 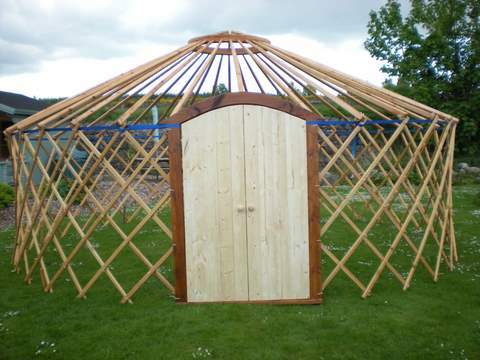 I am sending 4 Yurt panels although there are 5 that are now “show ready” so I will reject one of them at the last minute. Despite not looking forward to an outing to Great Yarmouth, I had a surprisingly fun day. It is a Norfolk seaside town that is a smaller, down-market version of Las Vegas. It is certainly an amusing place to do some serious people watching. 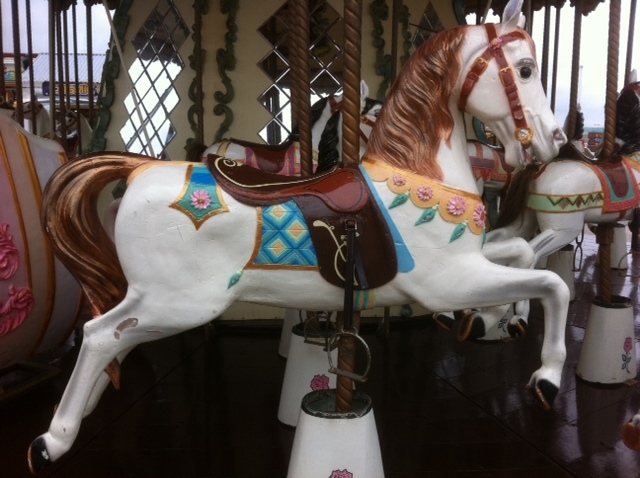 It was a wet and windy day so, wearing raincoats, we braved the roller coaster, waltzers, haunted house, snails and the vintage merry-go-round horses. The children lost money on the grabbing machines and the addictive 2p pushers. They were amazed that I could throw darts and delighted when I won a goldfish in a small tank. After a cheap supper on the market of chips, mushy peas and cockles, we went to a cinema that seemed to be trapped in a time warp to watch “Transformers 3”. I am sorry to say that the little fish only survived for two days so it had to be given a funeral complete with requiem and gravestone. It is probably just as well since it would have been very sloshed around on a 500 mile trip back to Scotland. Perhaps we should have taken the moral high ground and not entered a game where the prize was alive but at the time it seemed like a traditional thing to do on a family trip to the funfair. The tub of fish food cost more than the entry fee so the children are hoping for a replacement from our local pet shop. The weather was not that great for camping and we were glad that we had brought extra blankets. 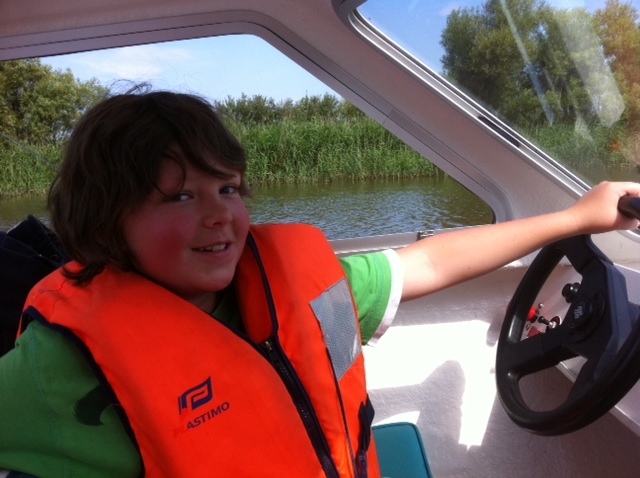 We were very lucky to have sunshine when we hired a boat for a day trip on the Norfolk Broads. Because the boat was electric, we saw plenty of wildlife including several swans that swam right up to see if we would like to share our picnic. We moored up at a remote riverside pub to sample some locally brewed ale. Fergus has decided that he would like a boat when he grows up so that he can moor up, drink some beer and go to sleep for the afternoon. I snipped loose threads, applied hot crystals and painted some details on 3 yurt panels that I had taken with me as I was worried about finishing them in time for the FOQ deadline on my return. They still have to have their sleeves & labels done and a few more finishing touches but they are almost there. I visited a group of quilters in Chedgrave where my Mother is a member and they were very complimentary about the panels, especially the Hare which I have now officially declared finished. While they tacked their raffle quilt for hand sewing, I helped to make the tea. We were all packed up ready for our camping trip so I went to lock up my workshop. Noticing that there was a strong smell of elderflower champagne, I found that one of the bottles had exploded and that several others were bulging ominously. I tried to move them gingerly like unexploded bombs into the large stone sink, aware that one of the plastic bottles was making a cracking sound like an iceberg. There followed an almighty deafening explosion and I was showered with sticky champagne and dared not open my eyes to survey the damage. Apart from dripping with fizz, there was also a fair amount of blood dripping from somewhere. 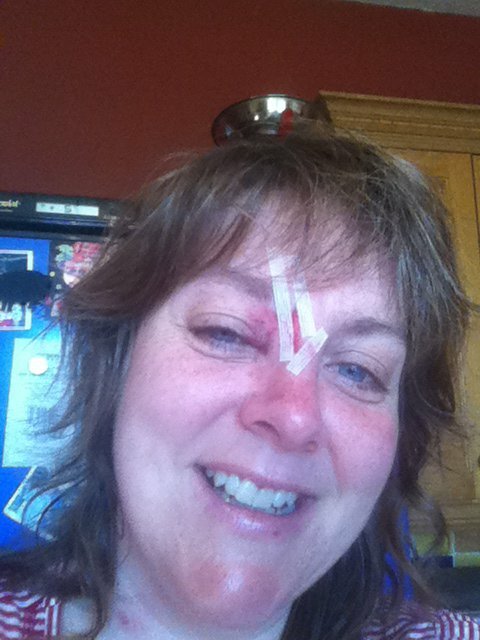 After I had showered for the second time that morning, I discovered that I had a deep gash just above my eye. Tania and Freya stuck it all together with some steri-strips while my husband attempted to mop up the mess and disposed of the rest of my home-brew. He wrapped the remaining bottles in a towel and threw them into the field where they exploded dramatically. I was extremely lucky that I did not get a direct hit in the eye and I dread to think what could have happened with glass bottles. It has been a curious experience having a swollen black eye – people seem to stare but avoid asking what happened as if imagining all sorts of domestic horrors. I did go to the surgery the next day where the nurse complimented us on our first aid skills. Instead of being taken aback by the unusual circumstances of my injury, she mentioned that her previous patient had been the victim of burns caused by scalding hot homemade jam. We have been spending a pleasant week with family in Norfolk where it seems warm even when raining in summer. I have to admit that I do not enjoy sleeping in a tent as much as I did when I was much younger. It is either chilly or too hot and I seem to lie in bed thinking I must go to the loo but would rather not get up and tackle all of the necessary zips on sleeping bag and tent walls. I have been trying to get into the spirit of it all but have sneaked back into my parents’ house a couple of times. We had a really enjoyable day in Norwich, visiting the castle, cathedral and wandering around the quaint streets. We had a delicious supper in the Waffle House which has not changed at all for years. After the shock of browsing in a trendy and expensive shop called “Jack Wills” with Freya I bought a simple skirt pattern and some Amy Butler fabric to have a go at dress making under my mother’s supervision. It reminded me why I don’t usually sew garments as I find it all so confusing. I think I could make another one if I approach it like a quilt with binding and buttons. Going to the beach and having campfires has not allowed me any time to embellish the show quilts that I brought with me, let alone work on the Yurt Book draft but it has been really great to spend time eating outside and toasting marshmallows. I decided to concentrate on getting as much done on the quilts for FOQ as I possibly could before the school holidays. The first hurdle was remembering which panels I had earmarked since I made the entry forms so vague in case I had to make substitutions. Three Yurt panels are being entered as a “triptych” but I will work on four then decide which ones qualify at the last minute. I was pleased with the quilting on “Yellow on the Broom” but secretly prefer the reverse side. I decided to work in a slightly back to front way and bind them all first. Next I will attach hanging sleeves, tidy up the loose threads and finally will deal with embellishments such as crystals and buttons. This means that I won’t have to worry so much about running out of time. 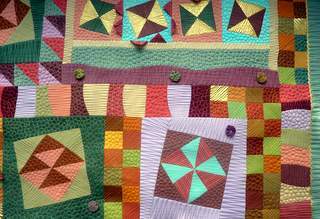 I started off with good intentions of hand sewing the bindings onto the backs of the quilts but soon decided that I had sore fingers and was bored and since I am a machine quilter, I will do the whole thing by machine. I think I do it pretty neatly and the Yurt panels are not strictly show quilts; they are just getting an “outing” to FOQ to show the quilting world that I still quilt! We had some serious downpours during the week so I did not feel guilty about spending as much time as possible in the workshop – I also had to fit in taking Freya to her grade 3 piano exam & school prize-giving, and Durris School’s end of term church service. Tania and I taste tested the elderflower champagne. It is rather cloudy because I added yeast, worried that natural fermentation wasn’t happening. It is extremely fizzy and tastes OK but could do with a stronger elderflower flavour, perhaps by adding some cordial. Ginger could also be an interesting addition. I will make a note of these improvements for next year’s recipe.